This Statute became effective January 2008. Chapter 633 clarifies and strengthens housing element law to ensure zoning encourages and facilitates emergency shelters and limits the denial of emergency shelters and transitional and supportive housing. Why is this important? Just look at what happens when it is announced that there is even the tiniest hint that emergency shelter will be built anywhere – anywhere! Suddenly everyone in the area becomes an activist. People who never give a damn about what impact building could have on the environment will show up en mass to prevent the construction of something to shelter homeless people. Even if the neighborhood is overrun with encampments. Here’s an example. 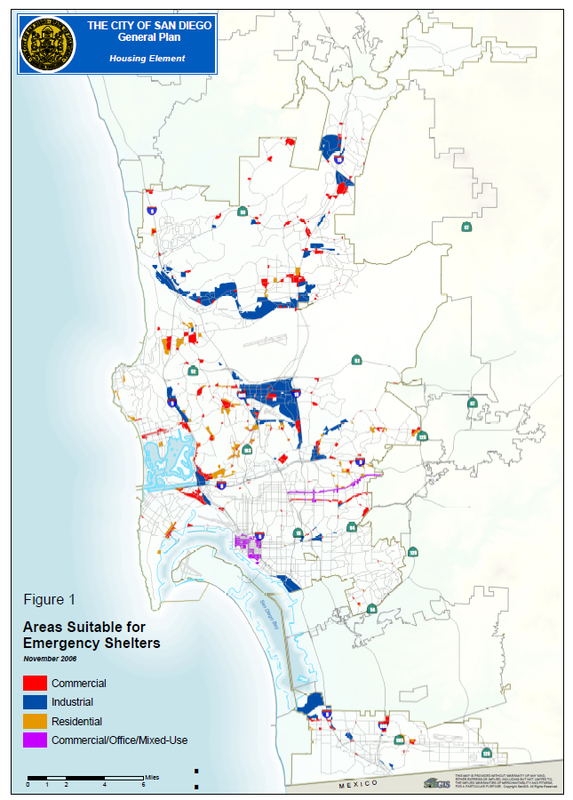 The San Diego Land Development Code (LDC) currently requires emergency homeless shelters to obtain a Conditional Use permit (CUP) with City Council approval. Given the current public resistance (to put it lightly) toward locating emergency shelters in any neighborhood without the exemptions bestowed by SB2, emergency shelters will never be built. In addition, a $21,501 fee must be paid to Civic San Diego staff to process a Homeless Shelters CUP. With funding for homeless programs at an all-time low, most agencies need that money for the actual project, not to pad the pockets of bureaucrats. To address the requirements of SB2, a local government may amend an existing zoning district, establish a new zoning district or establish an overlay zone for existing zoning districts. 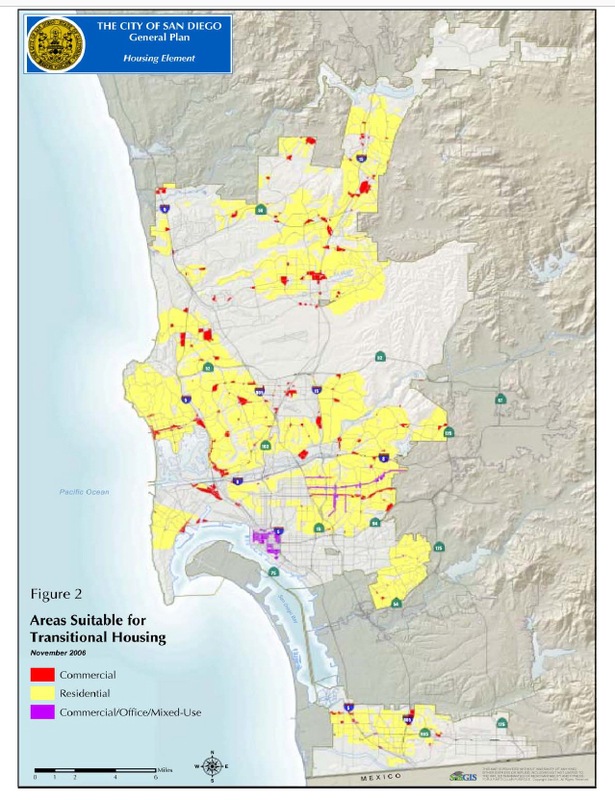 Figures 1 and 2 in the Housing Element complied with SB2 by providing an overlay of commercial, industrial, residential and commercial/office/mixed use zones where emergency and transitional housing could be located without the requirement of a CUP. The Midway Post Office wasn’t included on Figure 1, which was only part of the reason that project never happened, but look what was on the map! Notice that there are sites designated throughout the City. Figure 2, Areas Suitable for Transitional Housing, was even more generous. Which brings me to January 2016 when Amikas and a coalition of homeless advocates wanting to build a pilot program of a tiny home village as emergency shelter for homeless women and children were offered a lease on a lot in East Village. We met with the owner and he was very positive about putting the lot to use for the next 12 months while he decided what he wanted to do with it. The lot, located on the southwest corner of 17th St. and Imperial Ave. was located near the services at St. Vincent de Paul, and transit. The area is overrun with tent and tarp encampments, and we would be offering an alternative that would improve the safety and living conditions for both homeless and housed residents in the area. And it was on the map as an area suitable for emergency shelter. Our exhilarated but naive coalition put together a presentation and got onto the calendar for the San Diego Smart Growth and Land Use Committee for February 10th. Our attorney had written up a lease agreement and sent it to the owner. Everything was moving along as if there was a higher power sanctioning our efforts. But it turned out the “higher power” was not the beneficent One we were counting on to pave the way. We had our suspicions that someone who didn’t want us building a tiny home village in that spot had made the property owner an offer he couldn’t refuse. But we had no idea to what length the downtown power brokers were going to make certain we couldn’t try our concept anywhere. BUT nothing actually happened until three years later, and exactly one month AFTER our presentation to the Smart Growth and Land Use Committee where we had gleefully displayed Figure 1 from the earlier Housing Element. In a Report to the Planning Commission on March 11, 2016, staff recommended that the City Council approve proposed amendments to the Land Development Code and the City’s Local Coastal Program. Those amendments addressed two housing related issues, including compliance with the Cedillo Bill (SB-2). Using the January 2015 Point in Time Count (PITC), they claimed that their proposal needed to accommodate the 2,765 unsheltered homeless person in the City. 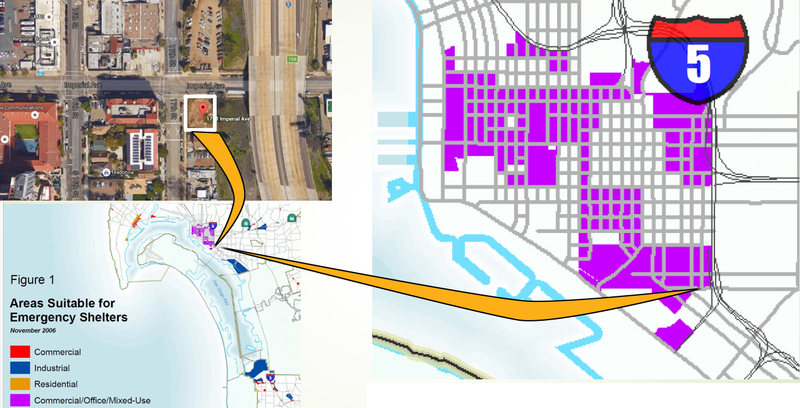 They identified two zones that met the criteria (access to transit, social services, employment opportunities and sufficient land area to develop emergency homeless shelter) for emergency shelter: IS-1-1 (Small Lot Industrial) and CCPD-MC (Center City Planned District Mixed Commercial). The IS-1-1 zone is a citywide zone currently located only in the communities of Pacific Beach and Midway/Pacific Highway Corridor. 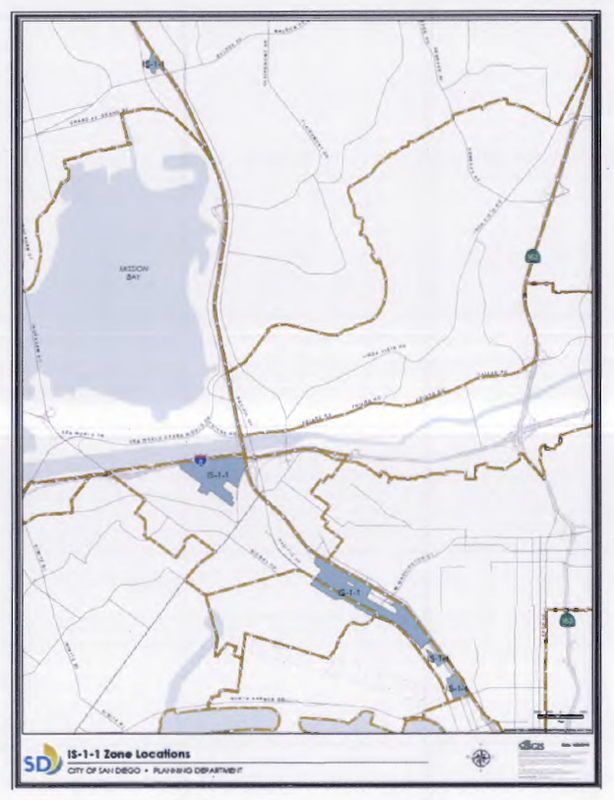 Within the Midway Pacific Hwy Corridor Community planning area the zone is generally located in the area between I-5 and Pacific Coast Highway, and in the area between the Sports Arena and I-5. Within the Pacific Beach planning area it is in a small area bounded by I-5, De Soto Street, Albuquerque Street, and Damon Avenue. The current land area of the IS-1-1 zone is approximately 180 acres; however, the Midway/Pacific Highway Corridor Plan Update proposes to reduce the amount of IS-1-1 zone, resulting in a revised acreage of approximately 57 acres. The CCPD-MC zone is located within the Centre City Planned District Ordinance. It is located in the East Village bounded K Street, I-5, Commercial Street, and 13th Street; and in the Little Italy neighborhood generally bounded by Laurel Street, I-5, West Fir Street, and California Street, with a three block long (six blocks total) portion of Neighborhood Commercial zone protruding into in the southern portion of the area an each side of India Street. The land area of the CCPD-MC zone is approximately 84 acres. Note that the CCPD-MC area includes the footprint of the proposed Charger Stadium (hmmmm). Just to be clear, access to social services is one of the criteria the site had to meet. AND page 1 of the report states that Midway Pacific Hwy. Corridor Community Planning group had voted 8 – 0 on February 17, 2016 to recommend denial of the amendment. As had been pointed out to us when we met with the planning group about using the Midway Post Office for veteran housing, that area also has its share of services for poor and homeless people, including the County Mental Health Services, Veterans Village and (until recently) the Homeless Veterans Tent. On June 21, 2016, the City Council voted to approve the Amendments to the Land Development Code which included only the IS-1-1 zone as a Process One limited use subject to regulations similar to those currently required when seeking approval of a CUP for an emergency homeless shelter. Not surprisingly, the only dissenting vote was Lori Zapf, in whose district the few sites are located. Assuming that it is impossible to get a CUP for emergency shelter outside of the 57 acres defined here (which by a quick site viewing do NOT actually seem to be available), the City has made a mockery of compliance with SB-2 while effectively making certain that no new or innovative projects to quickly house the thousands of people living on our streets has a chance in hell of getting off the ground. If you wish to challenge the Council’s actions on the above proceedings in court, you may be limited to raising only those issues you or someone else raised at the public hearing described in this notice, or in written correspondence to the City Council at or prior to the public hearing. Katheryn Rhodes submitted written objections and Jeeni Criscenzo (this author) and Christina Imhoof personally appeared to voice our objections, including that this amendment is insufficient capacity to accommodate the need for emergency shelters. Not only is it insufficient for the number of unsheltered they pulled from the 2015 PITC (2,765), but I can show that the numbers are far greater and continuing to grow. As I explained in an earlier column, Homelessness and Housing by the Numbers, if you compare the HUD-mandated Housing Inventory Count with the number of unsheltered people in the City of San Diego counted on Jan. 29th as part of the annual Point-In-Time Count, the City of San Diego was short 2,311 shelter beds (Emergency Shelter and Transitional Housing). This is after assuming that by some miracle of efficiency we could fill the 434 beds that were reported as available but unfilled. It’s those unfilled beds that the City uses as a loophole to continue to fine and arrest people for illegal lodging and encroachment. But, as I explained in the column, there are many reasons a bed might not be filled, such as the fact that beds could be for specific situations, such as only for a person who is HIV positive or pregnant or sober, etc. And as the homeless situation worsens year after year, more and more of the people on the street have already timed out on the maximum stay in an emergency shelter. Currently that is 45 days at the year-round shelter at Father Joe’s. That’s not enough time for most people to find housing in the current situation, so you have people back on the street who are disqualified from going into the only year round emergency shelter the City currently offers. In a recent meeting with Councilmember Gloria, he indicated that my energies would be better spent convincing places that offer emergency and transitional housing to lighten up on the rules so more rule-resistant homeless people would be willing to go into the existing shelters. Say that was even possible, and by redirecting my efforts in this fashion I managed to get all of those empty beds filled, the fact is that we would have still been short 2,311 beds on January 29th, and now that number is higher by hundreds. Despite every effort to make homelessness disappear, particularly during the month of July, the numbers downtown have continued to increase. While residents in other areas of the city complain that efforts to drive homeless people out of downtown have driven them into their neighborhoods, the count done by the Downtown partnership and Downtown Fellowship shows otherwise. Homeless people downtown are just being shuffled around (and in and out of jail) and the increase in other neighborhoods is due to other factors. People who are taking prescription medication or who are engaged in legal or illegal self-medication, such as moderate alcohol consumption, are unreasonably prohibited from these activities in emergency shelters. What’s more, the existing homeless shelters do not accommodate all populations, including the most vulnerable, women, children, disabled, mentally ill and addicted. There is no argument that permanent shelter using a housing first model is the end goal. But in the meantime people have no place to go. If we are sincere in our mission to end homelessness, we need multiple alternative sheltering options that address these concerns and can be constructed quickly and adapt to the needs of various populations. No matter what your preconceived notions are about personal culpability for being homeless, we must get people housed and by now it must be obvious that what we’ve been doing isn’t working. We must be willing to try something new and we need the place to locate innovative sheltering solutions without undue barriers, as was the intention of SB-2. Based on all of the above, I ascertain that the City of San Diego is out of compliance with SB-2 as well as the 8th Amendment and any sense of human decency. They have “pulled a fast one” to open the doors for the Chargers Stadium and downtown gentrification. But they can’t fool all of us. We see what you are doing and you haven’t won this one yet. Older Article: Why Does Homelessness Persist in America’s Finest City?